PMML, the Predictive Model Markup Language, allows for predictive models to be easily moved into production and operationally deployed on-site, in the cloud, in-database or Hadoop. 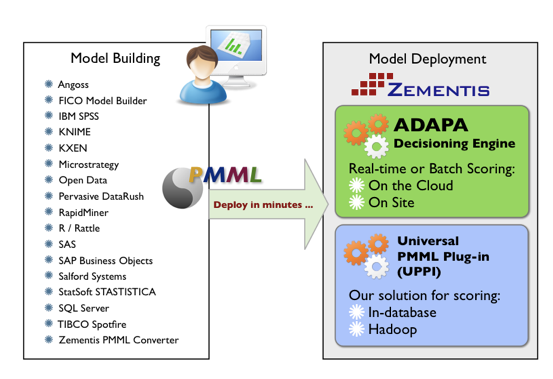 Zementis offers a range of products that make possible the deployment of predictive solutions and data mining models built in IBM SPSS, SAS, StatSoft STATISTICA, KNIME, SAP KXEN, R, etc. Our products include the ADAPA Scoring Engine and the Universal PMML Plug-in (UPPI). ADAPA, the Babylonian god of wisdom, is the first PMML-based, real-time predictive decisioning engine available on the market, and the first scoring engine accessible on the Amazon Cloud and IBM SmartCloud as a service. ADAPA on the Cloud combines the benefits of Software as a Service (SaaS) with the scalability of cloud computing. ADAPA is also available as a traditional software license for deployment on site. As even the god of wisdom knows, not all analytic tasks are born the same. If one is confronted with massive volumes of data that need to be scored on a regular basis, in-database scoring sounds like the logical thing to do. In all likelihood, the data in these cases is already stored in a database and, with in-database scoring, there is no data movement. Data and models reside together; hence, scores and predictions flow at an accelerated pace. ADAPA’s sister product, the Universal PMML Plug-in (UPPI), is the Zementis solution for Hadoop and in-database scoring. UPPI is available for the IBM Netezza appliance, SAP Sybase IQ, and EMC Greenplum/Pivotal, Teradata and Teradata Aster. It is also available for Hadoop/Datameer. ADAPA and UPPI consume model files that conform to the PMML standard, version 2.0 through 4.2. If your model development environment exports an older version of PMML, our products will automatically convert your file into a 4.2 compliant format.